Common waspThe council does not have a legal duty to provide a pest control service to control wasps. £29.70 (Incl VAT) for a full treatment for those entitled to any concession. 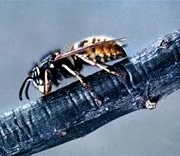 You may see what looks like a large number of wasps sitting on your walls in April and May. Wasp numbers are low at this time and these insects will be Masonry Bees and not wasps. We do not treat Masonry Bees and you will be charged for the call out (if not a WLC tenant) even if we do not treat. We aim to attend calls within 5 working days. However, during the busy summer period (July and August) due to the number of service requests, we may not be able to meet this target. You will be informed of availability at the time of your call. If the nest entry point is accessible from outside without you being present, you do not have to be there when we treat the nest. As there is no need for a fixed appointment in these circumstances, you may get a quicker response dependent on the officers work schedule. If the nest can be treated from the outside then there is no need to remove it. Wasp nests are used once only and removal of the nest is not carried out by the Council unless the presence of the nest is causing a health and safety issue by blocking vents or flues. No, There is nothing you need to do before we attend. However, under NO circumstances should you block up the entrance hole to the nest as you will be required to unblock it before we attend. We offer a choice of either 08:00 - 12:00 or 12:00 - 16:00 Monday to Friday. Normally a single visit is enough. However, should you still have activity at the same nest 5 days after treatment please contact us and we will revisit free of charge, However, if the nest is in another area this will also be chargeable as wasps never relocate and this will be a separate nest. No. There is no way to ensure you will not get nests in future years.